Oh yes, Sherlock Holmes 3 is all set to happen! Robert Downey Jr. was pretty clear on the fact that he will not be doing Iron Man 4 which was an utter sad and dreadful news, but the Only You star has said yes for Sherlock Holmes upcoming part. Yes, the actor is serious about saying no to Iron Man 4 and yes to Sherlock Holmes 3. During his promotion at Reddit AMA for his upcoming release The Judge, he said, “Looks like Sherlock Holmes 3 is going to happen.” And that one statement grabbed all the attention that was needed. The 49-year-old further stated, “Yes, we have Sherlock Holmes 3 in development. We want it to be the best of the series, so that’s pretty tall order.” The Sherlock Holmes star is also looking for Perry Mason property for future development. This will help in creating the 1931 atmosphere. A similar technique was used in the previous two Sherlock Holmes movies. Jude Law also mentioned that they had a meeting over this in the first half of 2014 and believes that plot is written but again, the big house Warner Brothers have yet to agree to pay. Downey Jr. also went on further praising another Sherlock Holmes, Benedict Cumberbatch. “I screen envy,” said RDJ. Cumberbatch plays Holmes for the BBC. Jonathan Stuart Leibowitz, or Jon Stewart as we know, started his career being a stand-up comedian before bagging television shows. Apart from being a television host, Stewart is also a producer, director, writer, actor and media critic. Jonathan Stuart Leibowitz was born on November 28, 1962, to Marian, a teacher and educational consultant and Donald, a Physics professor, in a Jewish family in New York. Ever since the divorce of his parents, when he was 11 years old, Stewart has been detached from his father, who is now deceased. He grew up in Lawrenceville in New Jersey and went to Lawrence High School where he claimed facing bulliesowing to his Jewish background. He graduated from The College of William and Mary, Virginia, in 1984. It was the college life when he chose to make radical changes in his life though they came late. He switched to Psychology from Chemistry and gave up his Fraternity. Jonathan Leibowitz’ career did not come straight either. He had worked as a contingency planner, a contract administrator, a puppeteer, a soccer coach, bartender, caterer and a busboy before returning to New York to become a stand-up comedian at the age of 24. It took him a year to find a major break via The Bitter End and Jon Stewart was born. Stewart started hosting T.V. shows in 1991, with the Short Attention Span Theater, which he co-hosted with Patty Rosborough on Comedy Central, followed by the 1992 show, You Wrote It, You Watch It. He went for his own talk show, The Jon Stewart Show, in 1993. Stewart also hosted the Academy Awards twice. He has been the host, co-executive producer and writer of the Comedy Central satirical news show, The Daily Show, since 1999, replacing host Craig Kilborn. He increased the ratings of the Show by 400% in 1999 itself. However, after 16 years of hosting the show and 19 Emmy Awards owing to the Show, he declared he is quitting, thereby forcing the name, The Daily Show with Jon Stewart change back to just, The Daily Show. Stewart is a writer too. He wrote two books on econometrics before unleashing the comedian in himself. His first book as a satirist or television personality, released in 1998. It was called Naked Pictures of Famous People. It became a best seller as per The New York Times. His 2004 release, America: A Citizen’s Guide to Democracy Inaction, became one of the top fifteen best sellers. Earth: A Visitor’s Guide to the Human Race, published in 2010, is his last book so far. The Daily Show no more to happen ‘with Jon Stewart’! On February 10 Jon Stewart declared that he will be quitting The Daily Show with Jon Stewart. He had totally changed the fate of The Daily Show when he joined in 1999, raising the TRPs by 400% in the very first season he joined the Show. However, the Show will go back to being called The Daily Show as Stewart’s quitting is confirmed. Stewart noted that “seventeen years is the longest I have ever in my life held a job” but “in my heart I know it is time for someone else to have that opportunity. Stewart, now 52, regards The Daily Show as “an incredible opportunity”. He was not only the host, but also the co-executive producer and writer of the Show. The exact time when he leaves the show is not yet declared but it is expected to be around the end of 2015 itself, if not as early as by the middle of this year. The reason for his retirement from the show is not known. Now that his quitting The Daily Show is a confirmed news, whether it is another show he will host, or whether he will quit hosting T.V. shows on a whole, is what fans are most concerned about. Comedy Central has confirmed that the show will however, “endure for years to come”, hence, chances of the show ending with the retirement of Stewart, can be safely dismissed. Sources claim that Stewart is trying to focus all his time on being a director now. However, those who love Jon Stewart as the host of The Daily Show, still have a few months to enjoy the vibrant and witty Stewart, as Comedy Central has also confirmed that Stewart will continue as the host of the show till late this year. Meanwhile, the question that is inevitable is, who is going to replace this legendary host of the show? John Oliver, AasifMandvi and Jason Jones with Samantha Bee, Tina Fey and Amy Poehlerare at the top of the list of possible and deserving personalities to fit the satirical, open mocking show. Chris Rock, Jessica Williams and Joel McHale and Seth Macfarlane are among others who can be considered as well. It is a matter of time to find out whether the new host will be one of them or someone absolutely fresh to the idea. We’re just a few months away from 2015, the year Marty McFly travels to in Back to the Future 2. Our hoverboards are nowhere to be seen, and our flying cars just don’t look right. But at least you can get your hands on the same light-up shoes our protagonist wore in the movie. Yes, we said light-up, but not lace-up; you’ll have to do that part yourself, although it looks like a simple velcro affair. The shoes are fully licensed and being sold by a Halloween costume company, with shipping expected in time for October 31st. Is McFly going to be a thing this Halloween? We doubt it, but that still shouldn’t stop you from spending the $100 asking price. 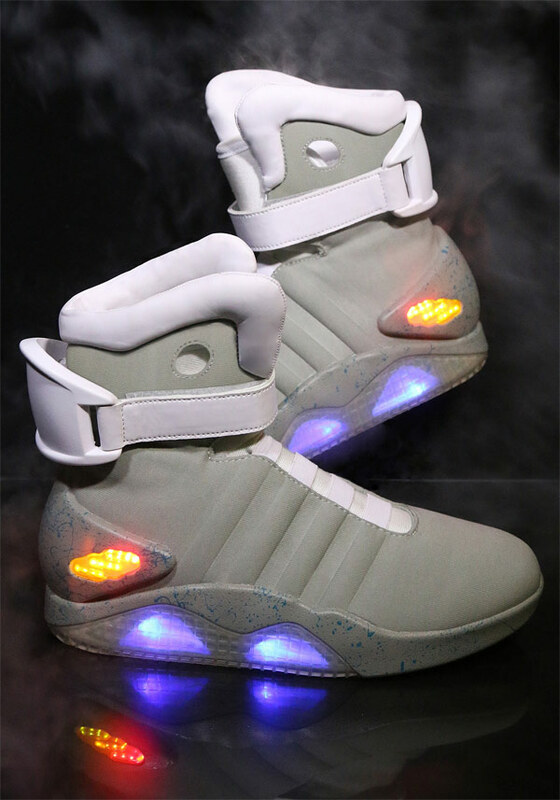 The post BTTF 2 Light-Up Shoes Available For Purchase appeared first on OhGizmo!.